This delicious basic Easy Baked Oats recipe is the perfect healthy breakfast dish. A no stir porridge, or baked porridge, is Slimming World plan friendly, and easy to make ahead. 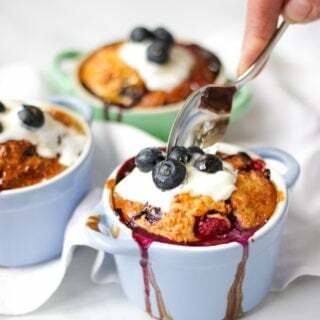 Serve with juicy raspberries and blueberries! Mix your yoghurt, eggs, oats and vanilla extract together until combined. Pour into a small dish. Bake for 30 minutes until golden and cooked though. If you would like top with a spoonful of yoghurt, a couple of whole berries and a drizzle of honey.